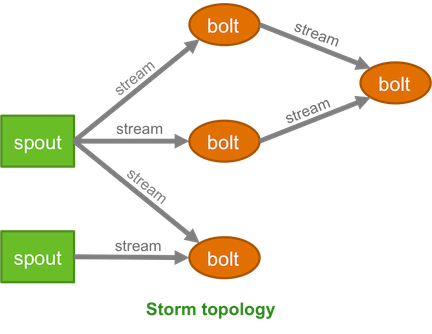 The following image depicts a Storm topology with a simple workflow. The TopologyBuilder class is the starting point for quickly writing Storm topologies with the storm-core API. The class contains getter and setter methods for the spouts and bolts that comprise the streaming data workflow, as shown in the following sample code.